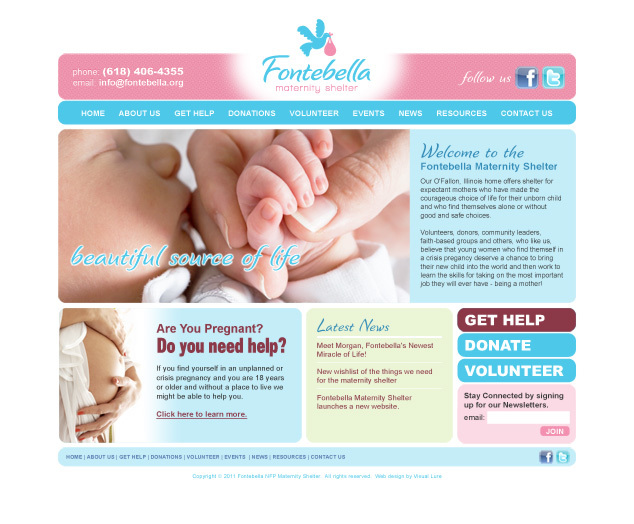 Visual Lure was recently contracted to design a new website for Fontebella, a St. Louis Metro East maternity shelter, located in O’Fallon, IL serving Southern Illinois. The new website will be built in WordPress which will allow our clients to update and maintain the new website with ease. We also designed their logo, which was inspired by a stork carrying a baby, but because it’s a faith-based shelter, we replaced the stork with a dove. Below is our proposed home page design. Check back soon for the launch of the new website. UPDATE: The new Fontebella website has launched. Check out the new site here: www.fontebella.org.